If there was a 10 start I’d give it. 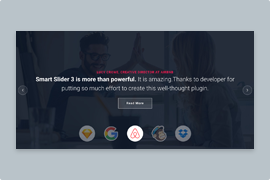 When I found Smart Slider 3 instantly knew that this was the premium slider I needed for all my projects. Cannot recommend this plugin highly enough. Get the Pro version. 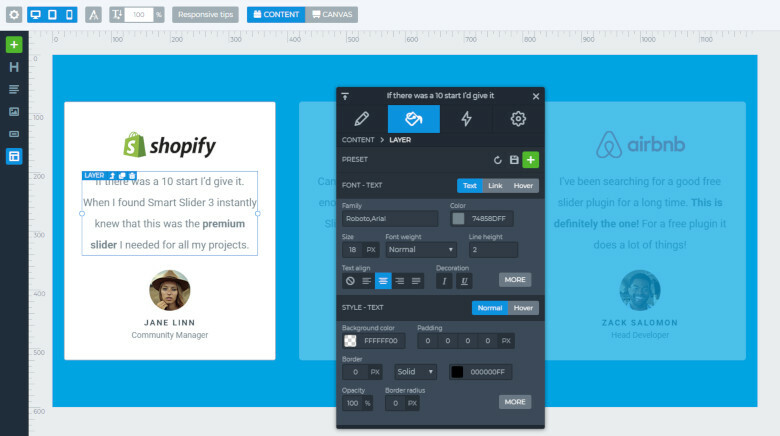 Use the Slider and all your website dreams will come true. The backend of the plugin is beautifully designed and fairly intuitive – although there are so many options, it’s almost daunting. 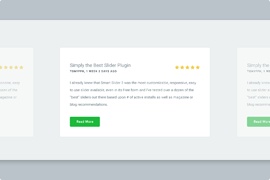 Description: Display your product testimonials in an elegant and modern way, using a testimonials slider. Minimalism and simplicity are the two expressions that surround the Testimonial Carousel slider. Displaying testimonials doesn’t always need fancy stuff. It’s not the effect that will convince your hesitant visitors to be your customers. The slider above isn’t fancy, it uses its minimalist design to convert. It has all testimonial slider requirements: the customer’s words, name, image and occupation. You can see all information the slider displays in a simple but clear way. We’ve used Content mode to build each slide, which makes sure their responsive behavior is great. There’s a company logo at the top, which isn’t required to create a good a testimonial slider, but it’s a nice addition. Below the logo you can find the customer’s testimony. It’s the most important part of the slider, so the text is written using an easy to read font, Roboto. The 18px font size and dark-grey color also helps the legibility. Below the text we placed the customer’s image. This helps making the testimony believable and building trust. The name and occupation of the customer is placed at the bottom of the slide. The slider has three different navigation options. The two most obvious are the arrows and bullets. The arrows are placed at the left and right side of the slider. They take a minimalistic approach, and their white color is easy to see on the blue background. You can find the bullets at the bottom of the slider. Just like the arrows, they have white color, although with a slight opacity. The active bullet is marked with an empty circle, which means it has only border but not background. The third way to switch slides is to click on them. Each slide has a custom link action to switch to the next or previous slide. 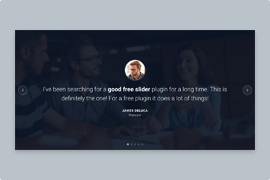 This custom navigation makes the WordPress Carousel look and feel special. 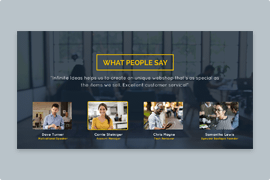 You can use the layout in your dynamic slide generator to create dynamic testimonials.